Way back in 1993 Steven Spielberg directed Jurassic Park, one of the most popular films of all time. It concerned a remote island on which lived genetically produced dinosaurs who inevitably broke loose from their confines to terrorise the handful of visitors. Microgaming have now released an online slot based on the movie and at first glance it’s a demonstration of how good a brand new game can look. 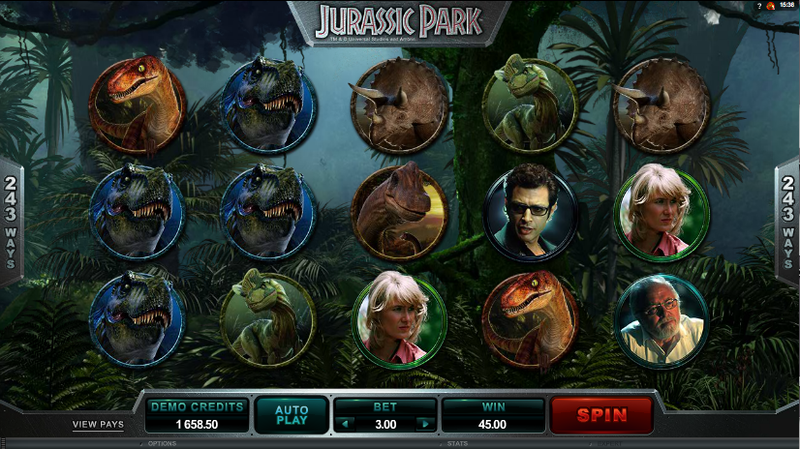 Jurassic Park has five reels and 243 paylines which means that all you have to do to land a win is get matching symbols in adjacent reels from left to right. The environment looks fantastic and the reels spin in front of a slowly scrolling jungle background while the original movie score plays as accompaniment. There are nine basic symbols, five dinosaur and four characters. The dinosaurs include a Velociraptor, a Tyrannosaurus Rex, a Triceratops, a Brachiosaurus and a Dilophosaurus. The characters are Dr. Allan grant, Dr. Ellie Sattler, Dr. Ian Malcolm and John Hammond. The Jurassic Park logo is wild and there’s a mosquito stuck in amber which is the scatter symbols. The wild can appear stacked on all reels. This occurs randomly whenever a T-Rex is sighted and for the next six spins an extra 35 wilds will appear on the reels. This clearly gives you lots more chances to win. Alert Mode only occurs in the base game. Landing three or more of the mosquito/amber scatter symbols anywhere on the reels will trigger the spins and there are five different sets on offer. To being with one of the following five will be selected at random but when you’ve triggered the feature twenty five times, you get to pick yourself. Each set begins with 12 free spins. Tyrannosaurus Rex – includes the Wild Reels feature in which stacks of wilds are present on all reels. 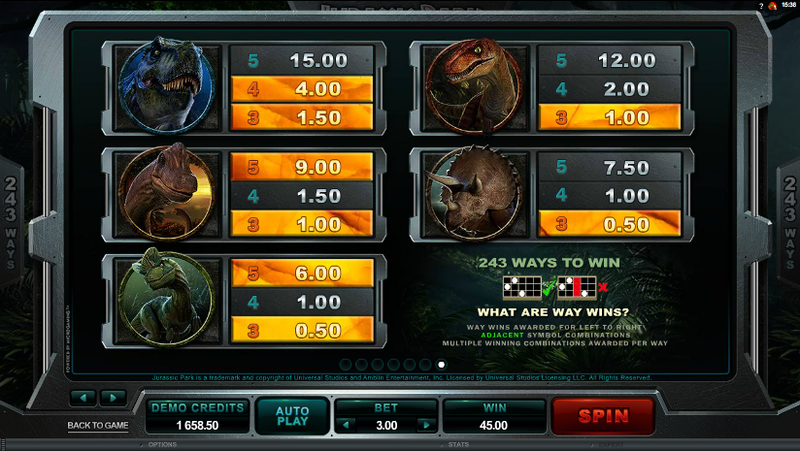 T-Rex symbols will be stacked 3 deep on all reels and when a T-Rex appears you are guaranteed a win. Velociraptor – including split and multiplier wilds in which the wilds can split into two if there is a win available. This can result in a six-of-a-kind win which pays double five-of-a-kind. A multiplier wild will result in a random multiplier of 4x, 5x or 6x. Brachiosaurus – including Mystery Multiplier in which every spin will include a multiplier of either 2x, 3x, 4x, 5x or 6x your win. Triceratops – including Running Wilds in which the first stack starts with three symbols with one more added per spins. A partial stack will result in a free respin to make a full stack and a full stack will also offer one free respin. Dilophosaurus – including the Winning Wilds feature in which the Dilophosaurus can appear on the reels and spit at a symbol, turning it wild. It will remain wild until it wins. The fixed paylines mean there’s nothing you can do here to alter your fortunes. Leave the sound on though for the full cinematic experience. This looks absolutely fantastic and is a game not to be missed. It has lots of bonus features and little extras like the short clips from the movie you will see when you land five characters in a row. Check it out ASAP!